It’s that time of year again! The Leona Valley Sertoma Scholarship committee is looking for applications from graduating seniors for the 2017 Leona Valley Sertoma Scholarship program. If you live in any of the Lakes and Valleys communities and are a graduating senior, or you know someone that is, the time to act is now. Don’t Delay! Applications must be turned in by March 31, 2017 to be considered for this year’s scholarship program. To learn more about the scholarship program and to download a copy of the application visit the Leona Valley Sertoma web site at: Leona Valley Sertoma. Qualifications information and Scholarship Applications are available for download on our Scholarship Program page, which is located under the “About Us” link in the menu at the top of the web page. Or use this link: Scholarship Program to go directly to the Scholarship Program page. Throughout the year Leona Valley Sertoma holds a variety of events and fundraisers and providing scholarships is one of the programs near and dear to their hearts. The number, and the amounts, of the scholarships are dictated by the amount of monies raised and the worthiness of the applicants. By helping students to continue their educations and build careers these Sertomans recognize they are insuring that the future can be a positive and exciting one. Their hard work in putting on these events is supported by the community through their attendance and participation, which means the whole community can take pride in knowing it is supporting the hopes and dreams of these graduating seniors as they begin their journey in to adulthood. The educations they receive will enable them to become responsible adults with the ability to handle the challenges they will face in their careers, as parents, and as citizens. The Leona Valley Sertoma Scholarship Program plays a key role in helping it’s members in achieving their stated mission of improving the quality of life in their local communities and to accelerate progress in health, education, freedom, and democracy. Through this program and their other programs they are helping people to help themselves and encouraging personal development. Pictured above are Shirley Kraft (left), Recording Secretary & 1st year Sertoma Director and with her are her grandchildren (l. to r.) Owen Spencer, age 5, Madeleine Spencer, age 8, and Jackson Spencer, age 11. On the far right is Jan Clark. Leona Valley is a small community, with a big heart, that lies tucked away in the northwest corner of Los Angeles County. Each year the Leona Valley Improvement Association hosts a community-wide garage sale where residents have the opportunity to set up shop, so to speak, to sell those unwanted items, that are just taking up space, and earn a little extra cash for whatever the family might need. This year’s garage sale event took place on September 24, 2016. 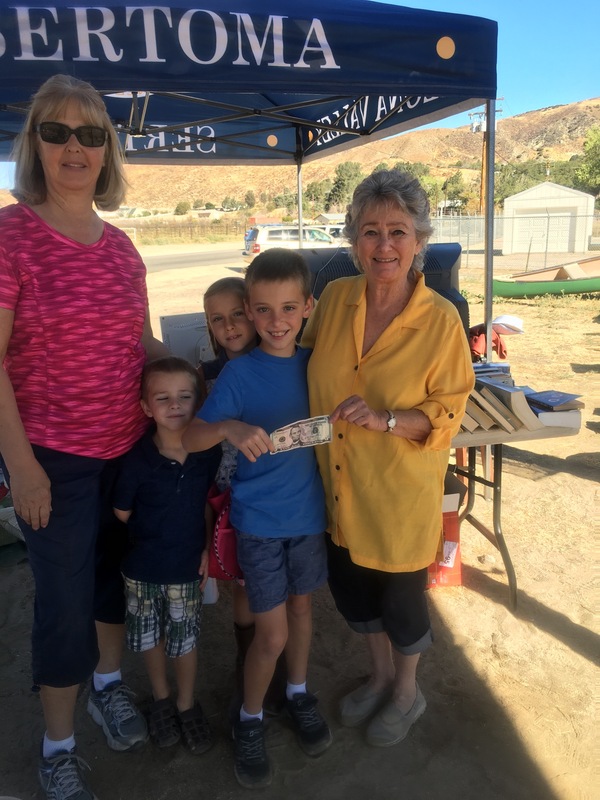 In the photo above, Jackson is presenting Jan Clark, Sertoma CEO, a $5.00 donation, while stopping by Leona Valley Sertoma garage sale location that is participating in the Leona Valley Annual Community Garage Sale. Leona Valley Sertoma has been serving the community since December 1997 and is chartered through Sertoma International, a non-profit service organization. The name Sertoma comes from the phrase, “SERvice TO MAnkind” and Leona Valley Sertoma is fully commited to doing just that, they serve the Lakes and Valley communities and to make a difference through sponsorship of a variety of programs. For the most part the funds go to our special SPONSORSHIP needs, such as, the senior Christmas dinner, holiday baskets, scholarships, school projects and so many more. Through their efforts they have always worked to improve the quality of life for those in their communities, wherever and whenever possible. Their efforts truly are making a difference and, if Spencer is any indication, that desire to help others is being passed on to those who will be the leaders of tomorrow. With the help of the Spencer children and so many other generous people, they are all helping to make a difference and are a part of the story that can only be called a “well rounded” success. Leona Valley Sertoma is dedicated to serving the needs of the communities in the Lakes and Valley areas of north Los Angeles County. Through the efforts of the members and with the support of many in the communities they serve, they have made a difference for the better in so many ways. The Sponsorship Committee is responsible for seeking out opportunities where the group can be of service to those in their communities. In addition to their outreach efforts, the Sponsorship Committee relies on those in the community to make them aware of where they can be of service and help make a difference for an individual, a family, or for the community as a whole. The Leona Valley Sertoma Sponsorship Committee has created the Sertoma Funding Request form to allow individuals, or groups, to share with the committees situations they would like the Sponsorship committee to be aware of. The Sponsorship committee can then review the request to determine if it is something that should be brought to the attention of the membership as a whole. You can download the Request for Funding form by clicking: Sertoma Funding Request Form or click on the form image below.